Do you love to play mobile games? 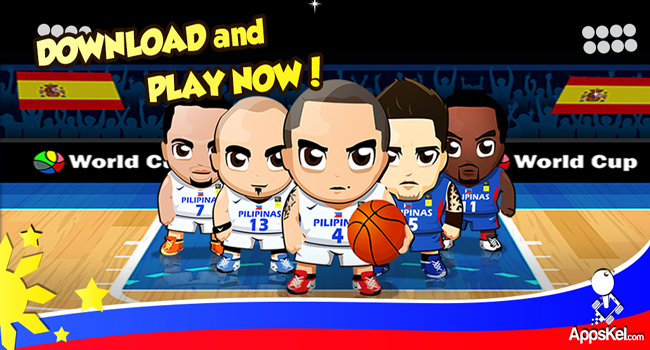 Do you love basketball, specifically following the FIBA World Games or Asian games? Well, now you can get the best of both worlds, in the latest, exciting, addictive, fast-fingered game to hit the app stores. Choose your favorite Team Gilas Pilipinas players as you try to avoid falling basketball rings and tap, tap, tap those fingers, to score! Once you accumulate high enough scores, you can unlock more of the top Team Gilas Pilipinas stars like Marcus Douthit, Marc Pingris, and Paul Lee, and tap all the way to the top. You can even play with Coach Chot Reyes! Each character offers a unique design and vibe, to give you the chance to find the one that you enjoy playing with the most. It could be Jason Castro or Jeff Chan. And you will get the chance to try them all, when you download the Gilas Pilipinas game and start tapping away whilst dodging rings. However, if you simply cannot wait, or you want to start off with a specific basketball star, perhaps Andray Blatche or Gabe Norwood, you can also use in app purchases to unlock these players. If you easily get bored of playing on the same court all the time, then we have great news for you. In this mobile game you will play on various different courts. Asian games stadium in Korea, World basketball arena in Spain, an NBA court – they are all available to play! You even get to play on a basketball court that has been destroyed by Typhoon Haiyan for an emotive game that displays Team Gilas Pilipinas' strength and determination to rise to the top. With a game that is ideal for all ages and that supports most android devices as well as all iPad, iPod and iPhone, the entire family can get in on the action! All you need to do is download it from your app store. Experience the game, accept the challenge, play the court, unlock the players – and have a ball!